– Netaji Shubhash Chandra Bose at a military review of the Indian National Army, July 5, 1943. If any political figure cast an enigmatic spell on the people of the Indian sub-continent through his uncompromising attitude towards liberation from the imperialist forces, then it would be Netaji Shubhash Chandra Bose. His recalcitrance, which was a threat not only to the British Raj but also to any figure in authority including Mahatma Gandhi, was in fact an emblem of free sprit devoted to the people's cause. However, it was not until recently that scholarly studies have revealed many parts of his life vis-à-vis the political developments of undivided India. Nevertheless, Bose's political career in itself has so many facets and aspects e.g. his allegiance to and dissidence against the Indian National Congress (INC), his inclination towards leftist politics, his formation of the Forward Bloc and Ajad Hind Fauj (Indian National Army) that those can hardly be contained in the sphere of one book. Then there is his personal life covering his education, ideological influences that shaped his political vision, profession, marriage, and his numerous correspondences with family and friends. 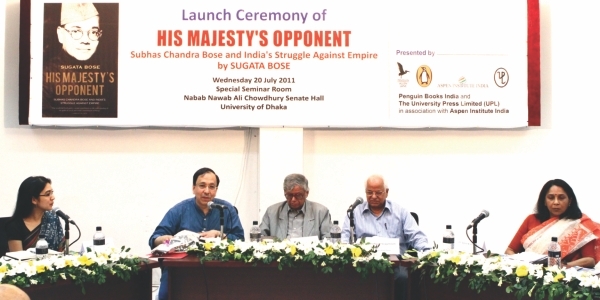 In the dearth of an all-inclusive account, Sugata Bose, Gardiner Professor of Oceanic History and Affairs at Harvard University, has attempted to present readers with a definitive biography of Bose's life titled 'His Majesty's Opponent: Subhas Chandra Bose and India's Struggle Against Empire' which has recently been launched in Bangladesh. Assuming the shape of a literary odyssey, the 408-page book does justice to every aspect of Netaji's life by drawing extensively both to his public and private selves. The author is a pre-eminent scholar on modern South Asian history and Indian Ocean history. In his last book 'A Hundred Horizons' he has worked out the 'historical antecedents of globalisation' by exploring 'India's economic, cultural, political connections with the wider Indian Ocean world in the 19th and 20th centuries'. Naturally, his take on Netaji's life also offers a comprehensive consideration of the objective historical processes that co-existed in undivided India as well as in the political history of the whole world leading to the catastrophic World War II. The author, who is Netaji's brother Sarat Chandra Bose's grandson having an easy access to all the family sources, is also joint editor with Dr. Sisir Kumar Bose of the Collected Works of Netaji published by the Netaji Research Bureau. Asked about what exactly prompted him to write the book, he said, “The fact that Netaji's life could be narrated as part of all the contradictions in global history in the first half of the 20th century has prompted me first. So it could be a story of one dramatic life but it could also be set in the context of world history. And it is only when I felt that I had the competence in European and Indian Ocean and Southeast Asian history to embark on this study that I decided to write it up.” Presenting Bose as an irresistible force in those days, Sugata shows that Das's political theories as well as practices are still very much relevant to the context of today's South Asia. The book, published by Allen Lane – an imprint of Penguin Books India, was launched in Bangladesh at a programme arranged by the publishers in association with the University Press Limited (UPL) on July 20 at the Special Seminar Room of Nabab Nawab Ali Chowdhury Senate Hall, University of Dhaka. 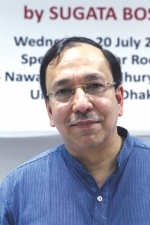 National Professor AF Salahuddin Ahmed unveiled the cover of the book. The launching ceremony was followed by a discussion in which Dr Sonia Nishat Amin, Dr David Ludden, Dr Iftekhar Iqbal, and Tahmima Anam took part as panellists. Moderated by Professor Sirajul Islam, the session was also graced by the Finance Minister AMA Muhit. Professor Salauddin in his speech highlighted Netaji's all-out effort to unite the Muslims and Hindus of the sub-continent. Presenting a brief biographical sketch of Netaji, he clarified the fundamental ideological difference between the non-violent movement of Gandhi and the armed struggle of Bose. Finally as the World War II began, Bose, having already launched the armed resistance in the form of Indian National Army, considered the war as an opportune moment to strike a decisive blow on the British Empire. “The strategy he adopted was to prepare for an armed uprising against the British with the assistance and support of those who were enemies of the British.” Terming the book a 'remarkable work', he concluded that Sugata has encompassed all these aspects in his book. 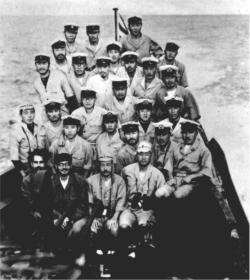 A photo dated April 28, 1943 shows Subhash Chandra Bose (bottom left) with the crew of the Japanese submarine. MK Gandhi at the Indian National Congress annual meeting in 1938 when Subhas Chandra Bose was President of the Indian Congress, Photos: archive . Writer Tahmima Anam marvelled at the literary qualities and the character of Netaji as portrayed in the book. She said, “Professor Bose is widely known for shifting and sharpening our understanding of the forces that have made South Asia what it is today. In 'His Majesty's Opponent' he continues in this tradition, complicating and bringing to light the character of Netaji as well as our understanding of Indian nationalism. Netaji's life and his charismatic personality had all the qualities of myth-making. However, the book celebrates Netaji not as a mythic character, but as a real person, a human hero with an unflinching commitment to political independence and an egalitarian society.” Referring to Bose's relationship with a European woman, she added, “Amidst so many important social and political points made in the book, I was more attracted to the human ones that have portrayed Bose as a human being, not as a political figure. Dr David Ludden, an acclaimed European historian of India, found the book very interesting because of its grounding in the history of a family. He said, “This is a book which is grounded in the history of a particular family. However, there is an interesting way in which the book indulges in a series of family relationships and also steps back from all family connections. On the one hand, the author historicises and on the other hand, he novelises or creates a heroic figure.” Terming the book deeply nationalistic, he added that nation is a very important feature in this book. Along with Netaji's devotion to sacrifice as described in the book, he also dwelled on his idea of 'cosmopolitan nationalism'. In the historiography of the Indian sub-continent, the most dominant trend in approaching history emphasises the role of a personality and considers his/her achievements as a key factor to having the course of history determined, and not the other way round. As a result, not only the objective historical processes but also several other key figures are left out in the dark in an attempt to build up a monolithic structure wherein only one person reigns supreme in the making of a nation's history. 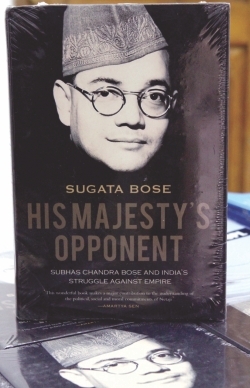 In this backdrop, Sugata Bose's biographical account of one of the most remarkable political figures of the Indian independence struggle stands out as a groundbreaking work that seeks to tell the story of Netaji's life by situating him in the context of sub-continental as well as world history and at the same time, by not without disregarding any of his contemporaries.